The so-called Pearl of the Antilles and the largest island in the entire Caribbean Sea, Cuba can seem a world apart from the refined paradisaical holidaying spots that surround it. For one, its history is still very much alive. Revolutions and communism are still fresh on the mind, and the museums showcase weapons that helped overthrow the government only decades ago. The hills are still marked by the footprints of men like Che Guevara and Castro, while sugar plantations belie the colonial boom and dark tales of slave driving. Then there’s historic Old Havana, bursting with age-stained Baroque builds and glorious palazzos, the sounds of lively jazz and cabaret after dark. Meanwhile, Cadillacs unchanged from the 50s whizz by down pot-holed roads, and the locals erupt in ad hoc fiestas of dance, song and barbeque. The Malecon of Havana is the Pearl of the Antilles writ small. It’s a place where leather-faced locals puff cigars the size of plantains, where Cadillacs bounce and bump over the uneven roads, where gloved boxers spar with the tropical airs and street entertainers coalesce with lovers amidst the salty sea breezes that roll in from Florida and the Key West straits to the north. A whopping 7 kilometers from beginning to end, this bustling promenade is a veritable symbol of the city. It’s gained historical status and oozes with Baroque and Art Deco styles, is painted in hues of Cuban pink and yellow, and throbs with Spanish chatter and energy. It’s simply not to be missed! Ah, La Habana Vieja: a little enclave of Spain in the Caribbean. This UNESCO-attested district that occupies the heart of the capital of Cuba is unquestionably one of the most authentic and earthy places in the Americas. The architecture is striking, with rows of peeling baroque townhouses and Andalusian-style arcades fringing the roadways. The facades ae stained by age (and pollution), and hide tequila cantinas and soukous rumba bars below their hatches. The squares, from central Plaza de Armas to Plaza de la Catedral, are adorned with gorgeous historical churches and neo-classical palaces. And then there are the fortifications, dominated by a trio of Fortaleza that tower over the urban canals with bulwarks and cannon holes courtesy of the 17th and 18th centuries. 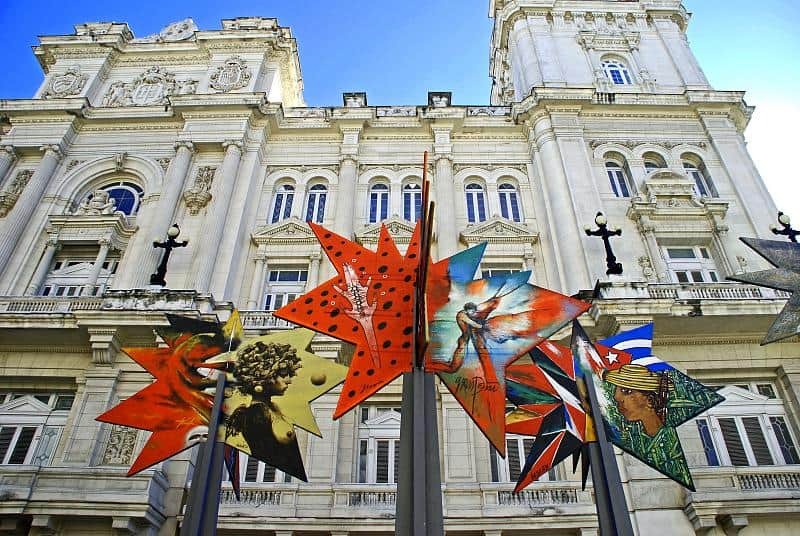 Another of the great and unmissable institutions to make its home in the midst of the historic streets of La Habana Vieja, the Museo Nacional de Bellas Artes is loaded to the brim with masterworks that chronicle the various artistic periods of the island and its people. Visitors can come and see the psychological portraiture of Federico Beltrán Masses, the politically infused paintings of Guillermo Collazo, and modern sculpture works by the likes of Rita Longa. Another branch of the institution nearby offers a host of worldly art, from ancient Greek vases to canvasses by El Greco and other Spanish masters. Smack bang in the heart of the island, between the streets of pretty Santa Clara (the site of one of the most pivotal battles in the Cuban Revolution incidentally), the great marble mausoleum to unquestionably the country’s most iconic son stands tall and proud. The final resting place of Che Guevara and 29 of his fellow revolutionaries is marked with a great bronze statue of the man, and also includes a fascinating selection of exhibits that showcase his gun, binoculars, water bottle, countless photos and various architectural artworks intended to mirror the character of the radical himself. Housed in the gorgeous neo-classical Presidential Palace in the heart of historic Havana, the Museum of the Revolution is a definite must for any history loving traveler making their way to the Pearl of the Antilles. The collections include raw and fascinating first-hand artifacts from the political upheavals of the 50s, like the guns used by Che Guevara and Camilo Cienfuegos, and even the very boat that brought Castro to Cuban shores during the Granma expedition in 1956. There are also exhibits dedicated to chronicling the country’s communist rebuilding in the 60s and 70s, along with sections that detail the independence wars against Spain. Far away from the city streets of Havana and the capital’s own UNESCO-attested fortresses, this mighty citadel crowns the rugged cliffs on the island’s south-eastern edge. Just a stone’s throw from the tactical and historical port town of Santiago de Cuba, the castle was raised by the revered Italian engineer Giovanni Battista Antonelli in the first half of the 17th century. Today, the complex of turrets and palisades, cannon batteries and artillery platforms is not only a World Heritage Site, but is also considered one of the finest remnants of the great power struggles that engulfed Cuba and the Americas throughout the colonial age. The mighty Sierra Maestra are the great anchor of the Cuban arc. Set in the deep southern reaches of the country, they cascade dramatically to the Caribbean Sea, rising in steep bulwarks and rocky promontories from Cape Cruz to the estuaries of the Guantanamo River. However, beautiful as they are, these hills rose to fame primarily for the totemic revolutionaries who trod their ridges in the 50s: Che, Fidel Castro et al! Today, visitors can come and take anything from single to multi-day hikes into the peaks, spying out the old secret headquarters of the rebels or simply wondering at the verdant cloud forests and tropical birds of Parque Nacional Turquino. There are plenty of trekking guides in the nearby city of Bayamo. Those pining for a bona fide Cuban fiesta should be sure to make a beeline for the aged town of Bayamo in the far-flung reaches of Oriente. Here, between the sun-splashed streets and the gorgeous historic and colonial facades (the town actually pre-dates Havana, with a foundation around 1513! ), the Fiesta de la Cubani erupts each week. Visitors can expect Cuban dancers and Caribbean tunes played on wobbly honkytonks, taste fiery island dishes and chat to the mountain folk of the south. Bayamo is also known for its accomplished chess players – so think twice before you settle down for a game with the locals! When the revolutionary history and the tooting traffic lines of Buicks and Cadillacs get just a little too much, it’s time to remember that Cuba is still a Caribbean paradise. And for that, there’s perhaps nowhere better than the narrow spit of sand, dunes and uber-luxurious hotel resorts that is Varadero. Jutting out of the north coast just east of Matanzas, along the edge of the Hicacos Peninsula, this patchwork of banyan trees and palms, ivory-white sand and lapping Carib swells is a top choice for kicking-back and relaxing. Expect cocktails on the beach and oodles of tourist markets touting those ubiquitous reggae trinkets. Under the sparkling Caribbean stars, between the streets of Marianao on the western side of Havana, the nightly cabaret shows of the Tropicana Club have been going on since the 1930s. Now a mainstay of the capital’s nightlife, the joint might not be cheap (entry is around $60!) but it’s known right across the planet for its bombastic dance shows and music nights, complete with showgirls clad in plumes of peacock feathers and shiny sequins. Tropicana is also known for its onetime reputation as a hangout of the Floridian La Cosa Nostr. One of the more off-the-beaten-track things to see in the capital of Havana, the Colon Cemetery is a work of art in itself. Packed to bursting with elaborate Gothic tombs and grand sculptures, it’s right up there with Paris’ Père Lachaise and Buenos Aires’ La Recoleta. The site is located just to the west of the historic heart of the city, demarked by one elaborate frontal gate designed by Calixto Arellano de Loira y Cardoso. At the heart of the cemetery stands the main chapel, painted in gleaming ivory hues and topped with gorgeous terracotta domes, while the graves span out in sections on all sides. The famous interred include the filmmaker Beatriz Azurduy Palacios, the poet José Lima and José Miguel Gómez, Cuba’s onetime president. The lethargic little town of Trinidad is one of the veritable jewels of Cuba’s south coast. Founded way back in 1514, it’s retained an authentic Spanish charm like few other towns in the Caribbean. The roadways are lined with tiny pueblo cottages, each painted a different ice-cream hue and half-baked in their adobe shells under the sun. The central plaza is shrouded by the Baroque tops of the Iglesia y Convento – a church that looks plucked from the hill towns of Andalusia (or, at least it would if it weren’t for the tropical jungles and peaks of the Sierra del Escambray in the distance). Simply wandering the cobbles, flitting between the old homes and palm-dotted Plaza Mayor, is an experience in itself! Once you’re done gawping at the glorious colonial edifices of pretty Trinidad, then be sure to make a beeline for the UNESCO-attested reaches of the Valle de los Ingenios (the Valley of Sugar Mills). Actually a trio of three valleys, the region was once the industrial powerhouse of the nation. An estimated 30,000 slaves would have tilled the lands, harvesting the sugarcane each season in the countless mill houses and plantations that peppered the fields. Today, travelers can ride the Baldwin Locomotive steam train through the area, climb leaning slave towers for panoramic views, and unravel the dark history of slave ownership at the Manaca Iznaga Estate. Okay, so it doesn’t have to be a morning swim, but when the beating sun rises and casts its pearly light across the turquoise bays and lagoons here, the sight is simply to die for! Yes, Caya Coco is touristic to the T, but there’s a reason for that. Think cotton-white sands and warm shallows, the occasional school of multi-coloured fish whizzing underfoot. Think all the fabled beauties of the Jardines del Rey, and the pink-hued outlines of the local flamingos for company in the water. Think sprawling luxury resorts with beachside infinity pools and manicured gardens of palm and fig and orchid.